I'm constantly amazed by my kids. They're probably the most engaging people I know and always teaching me new stuff. I spend a lot of time and energy thinking about how to get ideas across or help others do the same. Watching my kids, I realised something brilliant: They're not just more engaging than me but they're actually far better at presenting than I am - and they're better than you too. Children are instinctively great at presenting. Take my youngest, Hope, twirling around in front of me with complete confidence and freedom. I am struck by how much I could learn from her. Here are the 6 presenting hacks I've learned from my young, wonderful, storytelling kids. Young children don't spend hours memorising lines. They don't worry all day about how their play will be received or whether their work is original enough. They perform because they enjoy it, because they're passionate about their story and the freedom of being in character. I'm sure you'll agree that an unpolished talk from someone who clearly loves their subject is far more engaging than a polished one from someone who's indifferent. Of course it's good to practise and care about how you come across on stage (children aren't always amazing on this score!) 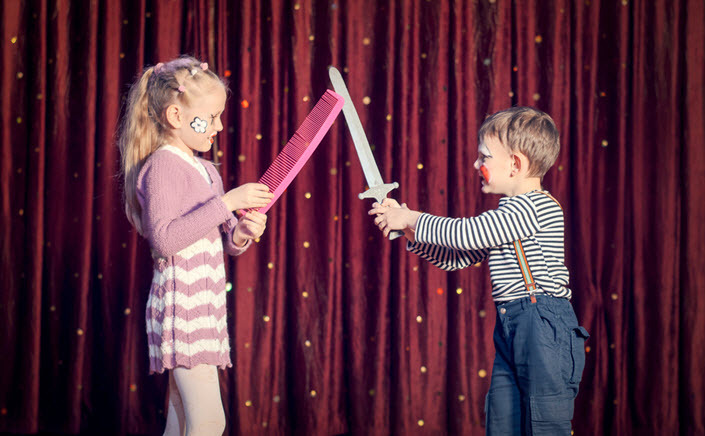 – but taking on the enthusiasm of a child in character will help make our presentations shine. Hope won't walk anywhere. She's nearly 5 and doesn't walk. Not because she can't – but because she would much rather skip, run, dance, hop or even crawl like a cat. Her movements say so much about her mood. Eden, my older daughter, was upset the other day. She looked down at her folded arms and said 'look how angry my arms are!' She was right – the expressiveness my children possess is free, wonderful and would make any presentation trainer feel proud of their student. Every emotion is represented physically – from quizzical faces to angry arms, grumpy stroppy walks and hand-over-mouth gasps. So often people speaking onstage or on video get nervous and become aware of their gestures and movements to the point they become rigid. It's widely known that up to 55% of communication is non-verbal. The right amount of movement and emotion obviously depends on your personality, the subject and the context. But it would be hard to argue that we're not far more engaging when we loosen up and allow our bodies to amplify our message. When Eden wants me to pay her some attention, she's not delicate about it. My children know they deserve my time, and aren't afraid to insist on it. It can be hard to mow the lawn with a child holding onto your leg, or watch TV with a big smiling face in front of yours. Sometimes, especially here in England, we are a little shy about grabbing our audience by the leg. As a speaker you're allowed to demand attention. Believe that what you have to say is important, and your audience will hang on to your every word. They'll benefit from your strong convictions and attention-demanding display. Here I am. Deal with it. What do my wonderful children do when I buy them a large new gift – say a basketball net? Run outside and shoot some hoops? Nope. They all climb into the box and ask to be pushed down the stairs. The fun that can be had with a stick and some leaves. Stacking stones. Eating dirt. Pulling the dog's tail. When you have no concept of how much something costs, the free things have a lot more value. I'm guilty of leaning on technology for my presentations. I want designer-created graphics, sleek transitions and expensive content. But I don't actually need any of it. One of the reasons we made VideoScribe and Tawe is because we believe in simple, tactile tools that enable an audience to connect with the story rather than shiny slides which distract. A flip-chart and some pens can be so very engaging, even if the presenter can't draw. Just watching someone create something live is a far more engaging experience than a laptop with bullet points. The best tactic I've found is to be resourceful and use whatever I have to hand. Since realising this, every talk I give seems to get more tactile. I don't know when I'll have taken it too far… presentation face-paints anyone? Isaac, my eldest, regularly presents concepts for his latest time machine (usually with visuals). His naivety is so engaging. He asks 'why shouldn't it work?' We bounce ideas off each other and sometimes he even convinces me that maybe he's unlocked the elusive secret to moving through time and space. His arguments are wonderful and he's so unafraid. If we all presented our ideas, our thoughts with this confidence (and engaging drawing talent) maybe the whole world would be a different place? As a speaker, I think it's important to stay humble and be open to having a dialogue with your audience. When someone asks a question and you're not sure how to answer, you have a choice. You could give a politician's answer (ignore the question and say whatever you want). You could pretend you know the answer. Or you could admit that you're not sure and turn it into an opportunity for discussion. What would my children do? They'd probably ask the question right back at me. Not a bad strategy, kids. Probably the greatest lesson my children have taught me is the power of imagination. My children love dressing up – pirates, princesses, Spider-man or maybe a mutant turtle. The minute they put on their costumes, they stop being children and become the whole character. They're not pretending at all. If one of my children decides to be a dog, they won't respond to normal human requests, only those a dog would respond to. Fetch! Sit! How beautiful, how marvellous. They make me feel so boring. In so many ways, it's about finding a story that encompasses you. I remember hearing about how Walt Disney used to tell the stories of the films he wanted to make – by taking on the persona of each character and acting every detail out in front of any audience who would care to listen. Story is something we have connected with through the ages and continues to be the most engaging medium we have at our disposal. Researchers have found that our brains are much more active when we hear stories. A wordy PowerPoint slide with bullet points activates the language processing centre of the brain, where we turn words into meaning. Stories do much more, using the whole brain and activating language, sensory, visual and motor areas. Have you heard of 'brain-to-brain coupling'? It happens when the brain activity of the speaker and listener synchronises during a story. By simply telling a story, the speaker can take the audience on a journey that makes them feel specific emotions and feelings. Now when I speak, I think – story. What story can I tell to explain this point? What experience can I use to help my audience connect with this topic? Is there a metaphor here? If presenting is an art, then take this inspiration from one of the world's most famous artists and follow these steps towards being more honest, open and creative in your presentations. Will you be better at presenting than my kids? No chance.